Very first review comes from the USA! Release-tour starts on May, 17th! What is a great band without an album and what is a great album without a release-tour. You know already that you can preorder the CD here, but way better it is to check-out our tour dates and get it directly from us after having a great evening of live music experience. I will tell you the secret stories behind my songs and we will play different solos for you every single night. That´s for sure! Hope to see you at some of our shows! Welcome on my website! I´m glad you found your way here so I invite you to stay a while and check out my brand new album “Pridetime”. It is going to be released by double moon records as a part of “jazz thing – next generation” on May, 22nd. This is my very first album and I feel blessed that such great musicians as Ack van Rooyen & Tony Lakatos joined my band in the studio to record some of my original tunes and standard arrangements I´ve written. 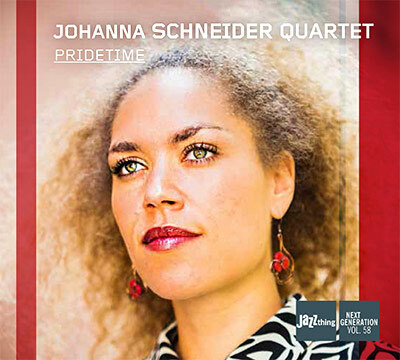 The “Johanna Schneider Quartet” consisting of Tizian Jost, Andreas Kurz, Bastian Jütte & myself exists since 2008 so I am more than happy to finally present this album to you! You can have a listen and preorder it already! Hope you´ll enjoy!